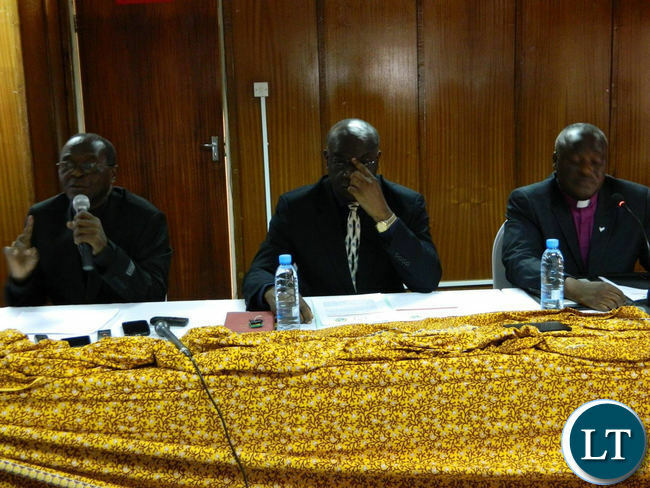 The three Church Mother Bodies in Zambia, namely: the Council of Churches in Zambia (CCZ), the Evangelical Fellowship of Zambia (EFZ) and the Zambia Conference of Catholic Bishops (ZCCB) have issued a communique on the national dialogue and reconciliation process. The Church Mother Bodies stated that they are aware of the immense expectations and trust people have put on the Church in Zambia to lead the much talked about dialogue and reconciliation process.They have however refused to be drawn into the discourse of who should lead the process and which other religious organisations should be part and parcel of the leadership in facilitating the dialogue and reconciliation. The Church Mother Bodies said they take the responsibility of leading the dialogue process as a calling from God to reconcile the nation in order to bring peace and harmony among God’s children in Zambia. In so doing, they neither seek political mileage nor publicity. The Church Mother Bodies said they have learn from the recent past in which our political leaders failed to abide by what was agreed upon during the Inter-Party Dialogue meeting held at the Cathedral of the Holy Cross on 29th March 2016, which the Church organized in order to respond to the many electoral and human rights issues that were troubling the nation. They attributed the current state of political division and socio-economic decline in the country to failure by leaders across the political divide,to abide by the very commitments they made to end political violence, misapplication of the Public Order Act and electoral corruption. The Church Mother Bodies believe that the peace accord brokered in that dialogue meeting should have marked a new beginning. Despite this the Church Mother Bodies said they will draw valuable lessons learnt from their historical success in 1991, when the three Church Mother Bodies, brought Dr.Kenneth Kaunda of UNIP and Dr. Fredrick Chiluba of MMD to a round table dialogue meeting at the Cathedral of the Holy Cross which resulted into Zambia welcoming the multiparty dispensation in a peaceful manner without bloodshed. our leaders to address the root causes of what is obtaining, and that many public pronouncements have been made by various stakeholders regarding this dialogue process and how it should be moved forward. However, we refuse to be drawn into the discourse of who should lead the process and which other religious organisations should be part and parcel of the leadership in facilitating the dialogue and reconciliation. the many electoral and human rights issues that were troubling the nation. We LOOK FORWARD to serious commitment from ALL stakeholders in this process as we call upon them to remain focused and avoid political expediency that may derail the entire process. hand of God, Zambia will be set on a new trajectory that will ensure that we truly live in peace, unity and harmony by promoting a culture of true dialogue, good governance, the rule of law and respect of human rights. Previous articleIs Fathy Napsa Stars’ messiah? Bottom line is that Lungu is a corrupt thief. The only thing he knows is stealing and drinking. These Bishops and church bodies are more actively involved in Politics than they should. Are you sure you know each of these Bishops to a level where you can point a finger of corruption? Did you personally bribe anyone of them…or did they bribe you or any one you know? Silence is also wisdom it is better than bringing misfortune on your life due to ignorance. If we had a capable Commander in Chief, there would be no political violence. political violence, misapplication of the Public Order Act and electoral corruption are all encouraged by PF. Dialogue among political parties? Reconciliation? Church mother bodies? Non of these is constitutional. let UPND and HH move on. They lost the elections, appealed and the courts ruled otherwise. Dialogue will never happen until after 2021 when PF wins. Instead of [email protected], why not try [email protected]??? It is more appropriate and is true reflection of your miserable existence!!! I agree with King above. This dialogue thing, c/w ECL & HH being ” bitter rivals” has always amazed me. Surely, how have we ended up accepting this as fact when in reality it is simply because H H refused to accept an election loss? And ever since, he has been the aggressor. If Zambians cannot correctly analyse situations, then we will never get it right. HH has been given to much ear for just being a sour loser! This is what happens when your so-called leader refuses to have an independent body – Scotland`s Commonwealth to lead the discussion Originally agreed, then suddenly changes his mind, as a manoeuvre to have everything under his control. This discussion is actually opening room for doubts that any Zambian body can lead such discussions, whose results will be acceptable by all stakeholders. HH is a corrupt thief who enriched himself in the privatization of Zambians’ wealth. He now desperately wants to be in office so he could auction off Zambia to RSA and Angro! He knows what I mean! Sadly, he will retire in Hadream’s Land – in Namwala. You sharon, you are an empty vessal that makes the most noise. You are desperately afraid to go back to a broke Zambia so you cling on to a dream of keeping your foreign mission job. This dialogue is for Zambia and our country is bigger than your empty brain. Sitting down with a person with one Hagenda at heart is wasting time. What are you going to discuss to change a desperate man that has lost Helections five times in role but still wants to be President of Zambia? This is a distraction. Let him go away, far away! In 2021 President Lungu will send him into retirement and that will be the end of the Tribal Gathering Group masquerading as a party. @Rhapsody: YOU ARE VERY RIGHT. HH HAS REFUSED TO CONCEDE DEFEAT. AND THAT IS THE REASON FOR THIS SO CALLED STAND OFF. FOR AS LONG AS HH CONTINUES TO CONCEDE DEFEAT, THE SO CALLED DIALOGUE WILL NOT WORK. IT IS ANOTHER WASTE OF TIME AND RESOURCES. WE CANNOT CONTINUE WASTING TIME DANCING TO THE TUNE OF A LOSER. ALL BY ELECTIONS ARE CLEARLY SHOWING THAT THE MAN LOST PANTS DOWN. HH WILL CONTINUE CHANGING GOAL POSTS. IT WILL BE A WILD GOOSE CHASE. WHAT IS WORSE STILL IS THE FACT THAT HE WILL NEVER WIN THE PRESIDENCY IN THIS COUNTRY. AND IF YOU WANT TO BE HAVING DIALOGUES WITH EACH OF HIS EVERY LOSS, YOU CAN GO AHEAD. Three Mansions are always in the cult and occult. Trusted friend of directionless h.h, Maimane of DA south africa, has just lost a High Court case of expelling Zille from the party and hence as Mayor of Cape Town. Unlike hmh however, there is no indication thay he will appeal….but you never know with h.h’s friends….same stubborn political dunderheads. Or maybe its a mistake on my part to equate these cows to our type of politically bankrupt, futureless and politically directionless cow h.h? If the court rules anyone is bound to accept, but when the court decides not to rule because of time which they, themselves misinterpreted, it leaves you with nothing to accept bwana. Just start the process naimwe ba ‘church mother bodies’ whatever that means, ukumeka kwati banakashi na tu lipstick pa milomo, ala bane!! !